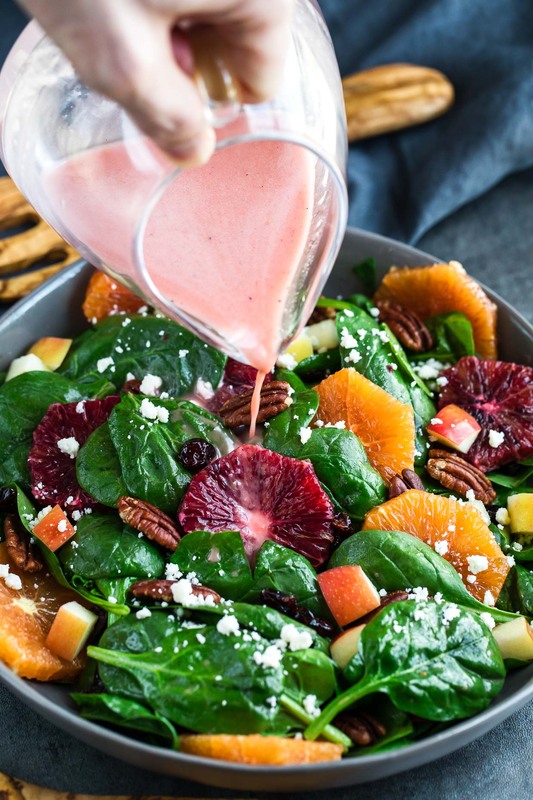 Apple Citrus Spinach Salad with Blood Orange Dressing aka my new favorite way to faceplant into a bag of spinach! This speedy spinach salad is spiked with fruit, nuts, and cheese then topped with the most delicious homemade dressing! So it’s no secret that I have an insane amount of salad recipe dressings here on ze blog. I pretty much stopped counting after 20 because I’m showing no signs of stopping here when it comes to adding to our arsenal. I’m not quite on team “never eat the same salad twice” but I’m telling ya, I could easily never eat the same salad twice with all the endless topping, mix-in, and dressing options to be tinkered with. The saladbilities are endless, yo! Ok that was too cheesy even for me. 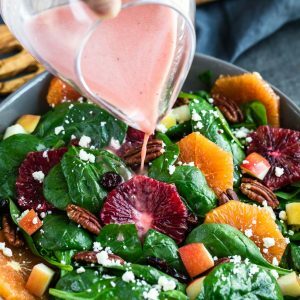 Forgive me and I’ll give you the recipe to my crazy delicious blood orange dressing and even throw in the recipe for this awesome apple citrus salad too! 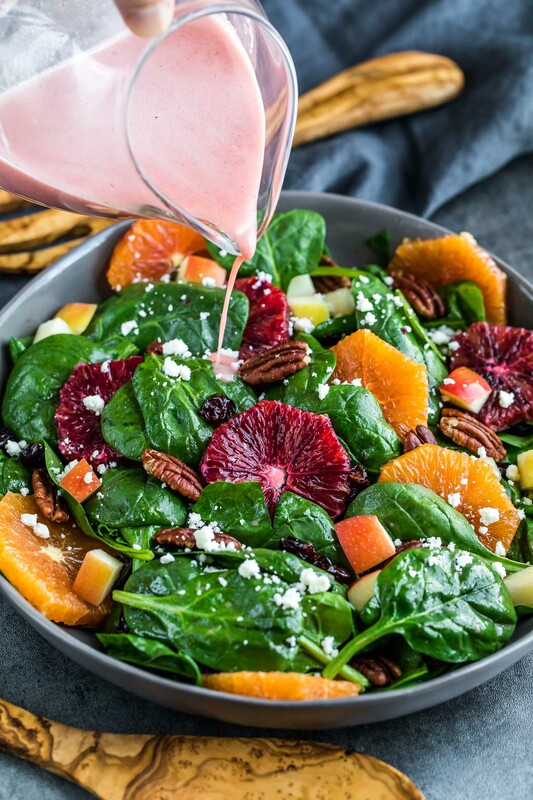 This fresh spinach salad features apples, oranges, feta, and pecans (which are all ahhhhhmazing together) dressed with a sweet, citrusy blood orange dressing. Looking to make this scrumptious side salad into a meal? It would pair great with chicken, steak, or shrimp and ze hubs even suggested adding homemade croutons to give it a panzanella vibe if you’re craving some carbs. For the pecans you have 3 glorious options: Serve them up plain and raw, toast them for extra nuttiness, or whip up some 5 minute candied pecans to sweeten the deal even further. If you’re not a pecan lover or simply don’t have any on hand, you can snag walnuts, sliced almonds, or even try roasted sunflower seeds which would be a great nut-free option if you need it. Sooo…. I’m totally rambling here. In a nutshell: lots of options, lots of deliciousness, make this salad right meow! This speedy spinach salad is spiked with fruit, nuts, and cheese then topped with the most delicious homemade dressing! Recipe yields 2 large salads or 4 side salads. 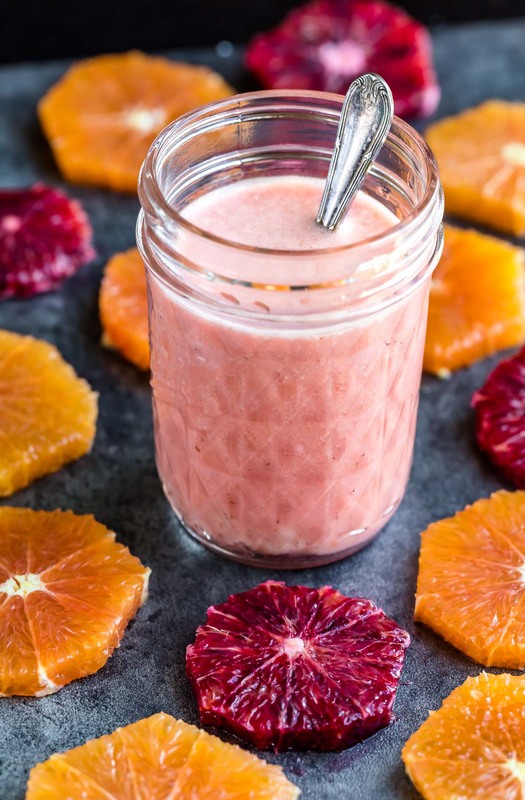 Combine blood orange juice (we're looking for 1/4 cup of juice here) with the remaining ingredients in a mason jar and shake well. For a completely smooth dressing, I used an immersion blender. You can follow suit with a blender/processor of your choice or leave the garlic as is - both ways work great! Wash and dry your spinach and add to a large bowl. Give your dressing another shake and massage a few spoonfuls into the spinach leaves to coat them. Top spinach with slices of fresh oranges (I used a combination of cara cara and blood orange) as well as chopped apple, feta, pecans and dried cranberries. Drizzle extra dressing to taste and dive in! The blood orange dressing can be made in advance and stored in a mason jar in the fridge. Shake well before serving. No pecans? No problem! Walnuts also work great. You can even use candied pecans or candied walnuts and get all fancy with it; they only take 5 minutes to make! I seriously can’t get over these gorgeous jewel tones! Be sure to stuff your face with as many blood oranges and cara cara oranges as you can while they’re crazy ripe and in season — they weren’t joking about that whole “nature’s candy” thing – YUM! 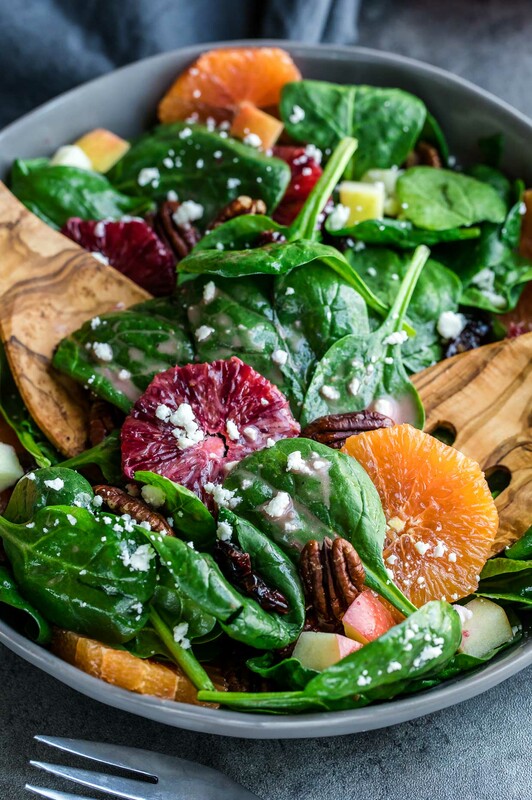 If you get a chance to try this apple citrus spinach salad with blood orange dressing, let me know! Leave some love in the comment form below or tag your photos with @peasandcrayons on Instagram so I can happy dance over your creation. This is a fantastic salad. I served it at our holiday party and again recently at a dinner party and it was a huge hit. All the flavors really blend nicely. The dressing goes a long way and even just doubling it for a group of 16, I had lots left over. Not really a problem since it is so good and works over any salad greens but keep in mind it is all fresh ingredients so use it up quickly. Absolutely gorgeous and the dressing is spot on! The blood orange juice made my kitchen smell just heavenly! The dressing/salad paired beautifully with our grilled chicken for a wonderful dinner!